When I saw this recipe over at one of my favorite blogs, Gimme Some Oven, I knew they were something I needed to try. I’ve been seeing all kinds of ways to fancy up the humble rice crispy treat in the food blog world lately and the perfect opportunity arose for me to join in. Some friends were having a gathering at their house and I asked what I could bring and dessert was requested. Life has been really crazy around our house lately so I was wanting to do something quick and simple. And these were just perfect. They seem more dressed up but are just as easy as the plain ole’ variety. I made a similar recipe to this – coconut oil instead of butter and funfetti cake mix instead of yellow cake mix – last week. They are super delicious!! Stopping by from Sweet Indulgence Sunday. I’ve seen these on Pinterest and been dying to try them! Glad to hear they turn out so well. Hi! Dropping by to let you know that your recipe made the top recipes for last week’s Sweet Indulgences Sunday. Hope you’ll stop by again this weekend and share a recipe. What a cool idea! I never would have thought to add cake mix to these! The cake mix must make it really yummy!!!! 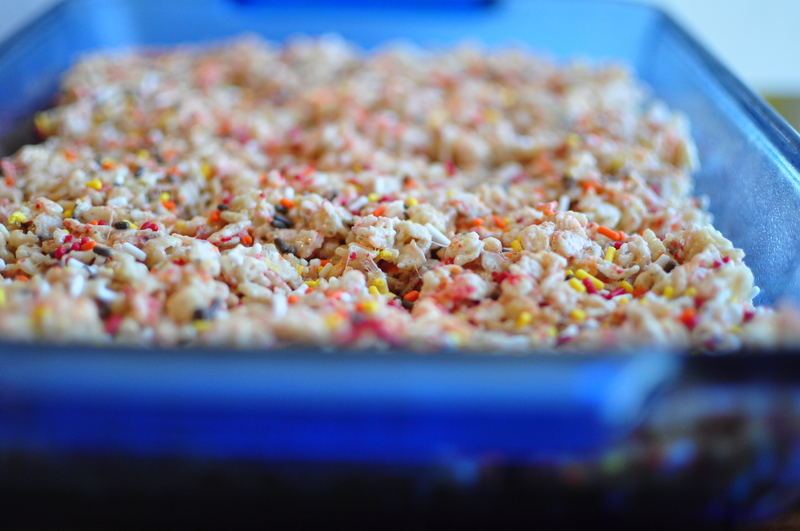 Your Cake Batter Rice Crispy Treats look awesome! Thank you so much for sharing with Full Plate Thursday. Hope you are having a great day and come back soon!